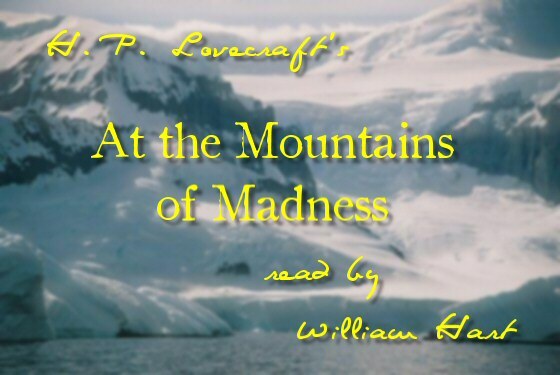 ← H. P. Lovecraft’s, “At the Mountains of Madness” Chapter 10 Read By William Hart Is Now On YouTube! I’m pushing forward now to finish this story before the 25th, so keep checking back here. Eleven chapters (roughly 95%) down, with one more (roughly 5%) to go, and the story will be complete! Chapter Twelve will be here very soon. If you hear any rain deep in the background of the final three chapters, please blame Mother Nature for trying to keep me from finishing as soon as I wanted to! This entry was posted in 1920's, 1930's, 3D, At the Mountains of Madness, Audio, Audio Book, Audiobook, Book, Books, Elder Ones, Free, Guillermo del Toro, H. P. Lovecraft, H. P. Lovecraft Updates, James Cameron, MP3 Files, Mythos, Necronomicon, Old Ones, Readings, Shoggoths, Universal Studios, William (Will) Hart and tagged 1920's, 1930's, 3D, At The Mountains of Madness, Audio Book, Audiobook, Book, Books, Cameron, del Toro, Elder Ones, Fiction, Free, Guillermo, Guillermo del Toro, H. P. Lovecraft, Hart, James, James Cameron, Lovecraft, MP3, Mythos, Old Ones, Readings, Shoggoths, Studios, Universal, William, William Hart. Bookmark the permalink.